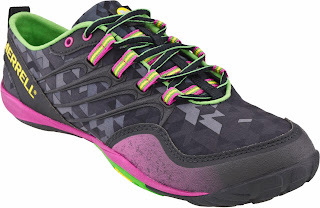 A few weeks ago I was offered the chance to try out a new pair of trainers...any trainers...from www.blackleaf.com, a site that sells a huge array of sports gear - not just running stuff, but clothes and accessories for biking, skiing, surfing, skating and generally being outdoors! I've been thinking of getting some new Merrells recently as my Access Arcs as getting a bit worse for wear, so had a look through the Merrell selection and chose the Lithe Gloves in this gorgeous colourway, which are another style in the Merrell barefoot running shoe family. I was very excited to try them out, and to see if they looked as good as they did in real life as they did in the picture. Luckily, they arrived really quickly...and they are beautiful looking shoes! Unfortunately, I think I should have stuck with my Access Arc's as they are incredibly comfortable and fit me really well. The Lithe Gloves seem to feel totally different and I've only been able to wear they once despite loving how they look, as they're just not a good fit for my feet. Although they have the expected spacious, wide toe-box, for some reason they are very deep, and after wearing them for just a couple of hours, walking around, they creased badly across the top and into my foot. The other problem is the fit around the heel - they rubbed badly and gave me blisters! I was really surprised, as I've expected the fit to be similar to my other Barefoot Merrells, but they just don't seem to suit my foot. However, always nice to be able to try out some different shoes, and I really appreciate the trial...and just wish I'd picked another of the many shoes that were available to me from the www.blackleaf.com website. Hey ho...we live and learn. It's probably not a bad thing...I think the house is a bit overwhelmed by the number of trainers I'm using at the moment, and not sure I have room for another pair in the hall!